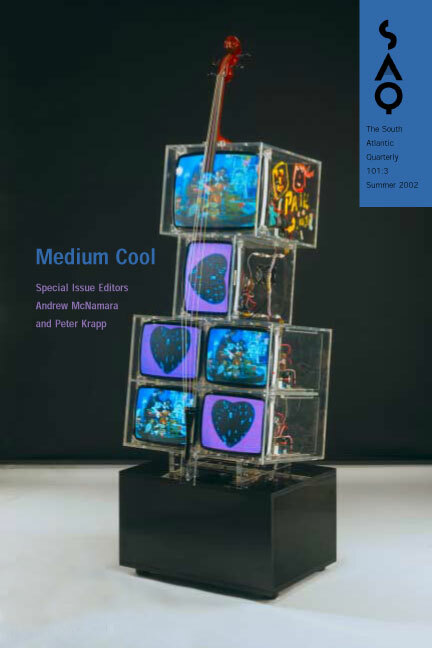 With Andrew McNamara, I co-edited a special issue of the South Atlantic Quarterly, devoted to contemporary cultural theory and critical media studies. Stanitzek, Georg: Fama/Chain of Muses: Two Classical Problems of Literary Studies with "the Media"
Nam June Paik (Korea/United States, b. 1932), TV Cello (2000), DVDs, video monitors, perspex, wooden cello neck with colored plastic strings and wooden tailpiece, marble base (232.2 cm x 75 cm x 55 cm overall). Kenneth and Yusko Myer collection of Contemporary Asian Art. Purchased 2002 with funds from the Myer Foundation, a project of the Sidney Myer Centenary Celebration 1899-1999, through the Queensland Art Gallery Foundation. Reproduced with permission from the collection of the Queensland Art Gallery, Brisbane.